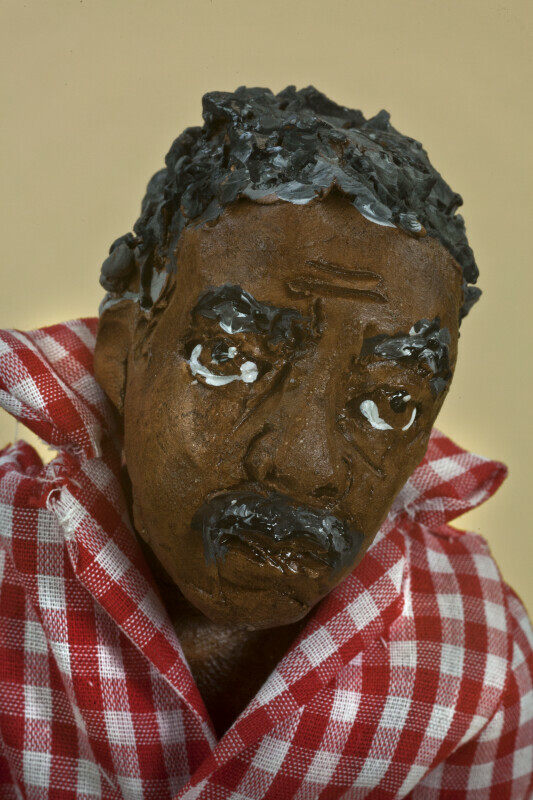 Close up photo of Mississippi mud figure. The mud for this man was collected from the banks of the Mississippi river. The clay is gray when it is collected. Then it is washed, sculpted, fired, and hand painted. The clay turns to a red color after it is fired. His head is hand painted, with hair, mustache, eyes, eyebrows, etc. Tag says: "Hand sculptured original made with Mississippi River Mud by Lorraine D Gendron, Hahnville, LA 70057." The figure is 9 inches (23 cm) tall.